Well it has been an interesting few days but we have made it to Taupo. Ruth powers past a commuter enroute to the bus station. A promising sign or a false positive? Our ride to the bus station and disassembling of the bike was easy until the bus arrived. In the melee to check-in our bags we were told to wait until last. When the driver finished with everyone else she took our two bags and put them in the luggage compartment but then pointed at our two folded and bagged bikes and said “you can’t take them on the bus”. She pointed to a typed note that had recently been stuck to the bus window “no bikes – no refunds”. I had watched as backpacks much bigger than our bagged bikes had been humped into the luggage compartment. “But they told us we could” I said, pointing at the ticket office. After discussion with the ticket office (come misinformation counter) regarding what we had been told, we were (with the appropriate bribe) allowed to load our bikes on. Luckily, there was a broken seat that they were able to sit on. It seems that the no-bikes-rule applies to double decker buses that have an elevated luggage compartment access. I accept the reason, but please tell your clients of that prohibition before they book their trip. 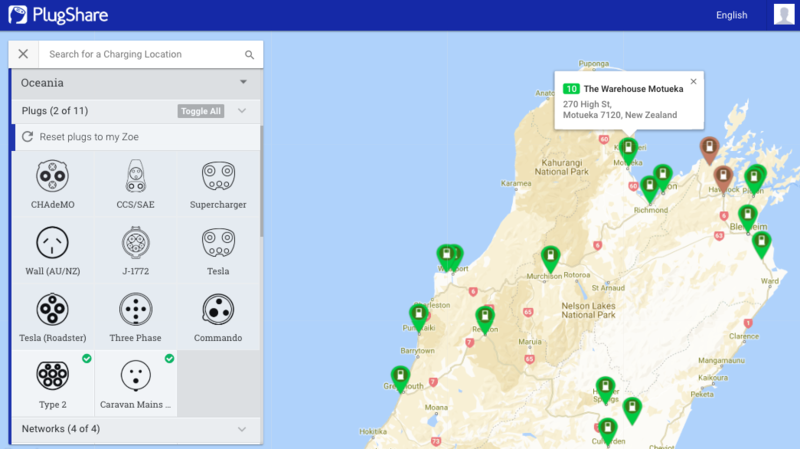 Our first job in Rotorua was to check the type of bus we are (hopefully) catching for the trip from Taupo to Napier. Apparently it is bike friendly as long as they don’t change the type of bus on the day. 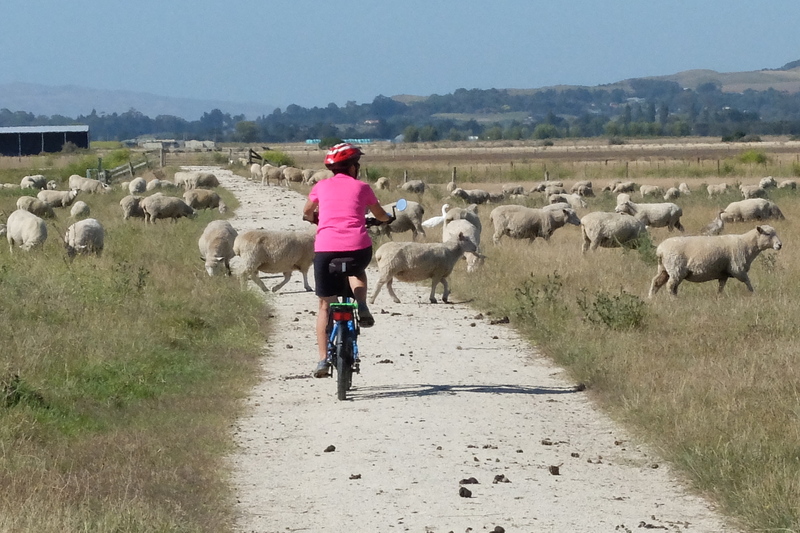 Our expected easy short ride from Rotorua to Waiotapu will, I suspect, be recorded as our toughest. We had a few issues. The bike/luggage configuration that worked on our ride around Taranaki starting failing for Ruth within the first few kilometres. Her bike was too light in the front and too heavy overall. If she was unable to perform a controlled stop she could not hold the bike up. On the pumice tracks she found herself off-bike, twice in a short space of time. While there was no major damage to Ruth this was not a good start, her confidence was in tatters with 700km still to ride. A slight detour to the Rotorua lakefront to view the grave and memorial to an ancestor. Gilbert Mair (jnr) is buried on the Marae at Ohinemutu. A little later as we stopped to take in Sulphur Bay we were still oblivious to the ‘hot water’ that our adventure was headed into. After riding through this area of steaming vents and boiling mud Ruth had her first incident. We made some adjustments and then the dirt track improved to a concrete path (as the trail notes promised). 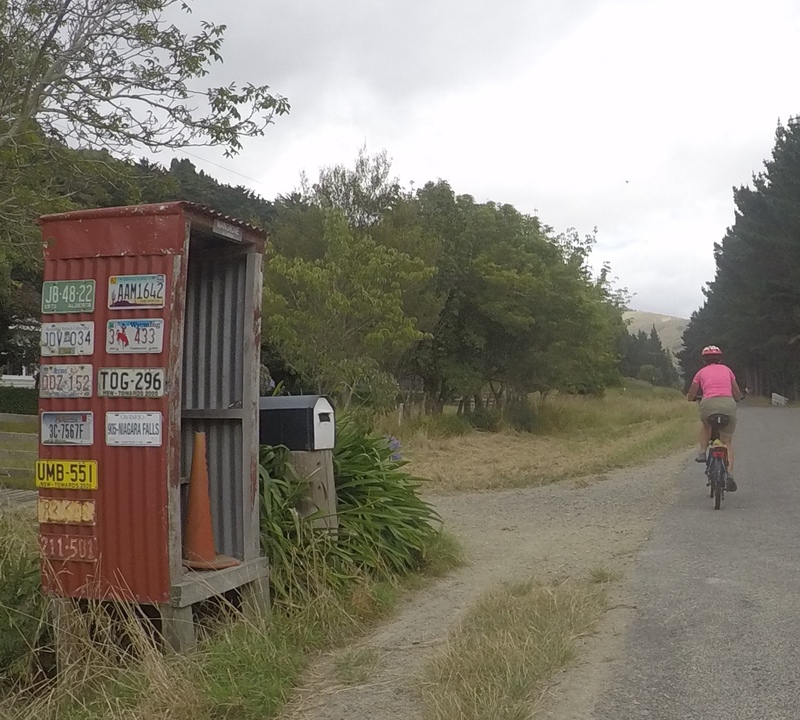 However, we soon started to realise that the Te Ara Ahi bike trail is not a particularly well maintained trail compared to the others that we have ridden. The signage was very patchy (code for getting lost) and the Rainbow Mountain section was barely suitable for mountain goats and certainly not suitable for any type of touring bike. Had we known this we would have ridden the main highway for that last 7 kilometres rather that push our bike and gear over some pretty treacherous terrain. The scenery was pleasant but we were pleased that we were pushing small bikes rather than full size. Ruth could not handle the steeper sections so I would walk my bike up and go back and get hers. And one of the better parts of The Ugly – I was too busy managing bikes to think to take pictures of the really bad sections. 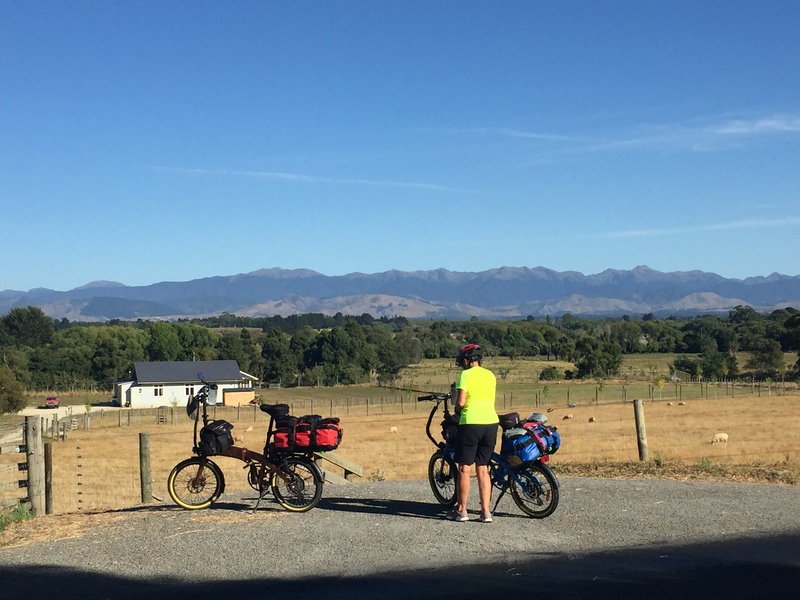 We finally descended to a dusty road, found that it connected to the state highway and mixed it up with the big trucks – but that was fine – there was a good shoulder to ride along, anything was better than where we had been. What goes up must go down – Rainbow mountain (our) nemisis) lurks menacingly in the background. The next morning we arose early. Repacked the bags so that the heavier items were in my bag and the lighter ones in Ruth’s. We changed Ruth’s handlebars to a standard setup. It makes them a little further from the body but it does mean that she is pushing down rather than pulling back on the handlebars. She is not so happy about this but it is a lot safer with luggage on the carrier. As if to reinforce the point, the screw that you loosen to change the configuration refuses to budge. 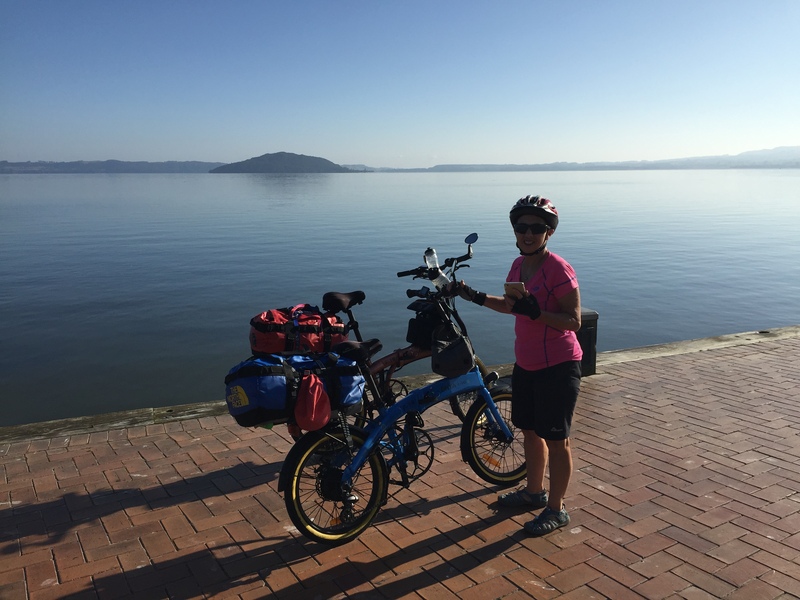 Ruth tests our early morning bike adjustments at Waiotapu. We stayed overnight in the tavern – it reminded me of The Baghdad Cafe of the movie of the same name. Ruth started to feel old as she surveyed the farm – the cowshed (left) and hayseed (right) were looking a little sad while the geothermal powerstation is a new addition – well it was completed 30 years ago. The cooling tower allows the water from the geothermal steam to be injected back into the field. 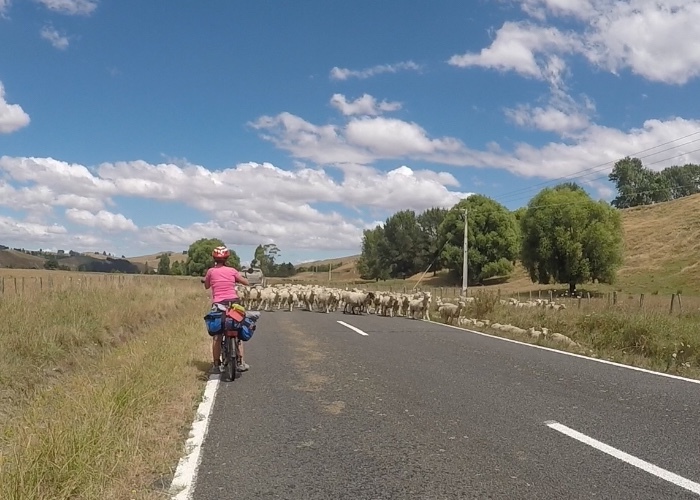 The 60km of day three was looking a little daunting. Ruth was not a very ‘happy camper’. This was not helped by my own knowledge that today we would encounter the heaviest road traffic for the whole trip. Don’t forget your helmet Cliff! 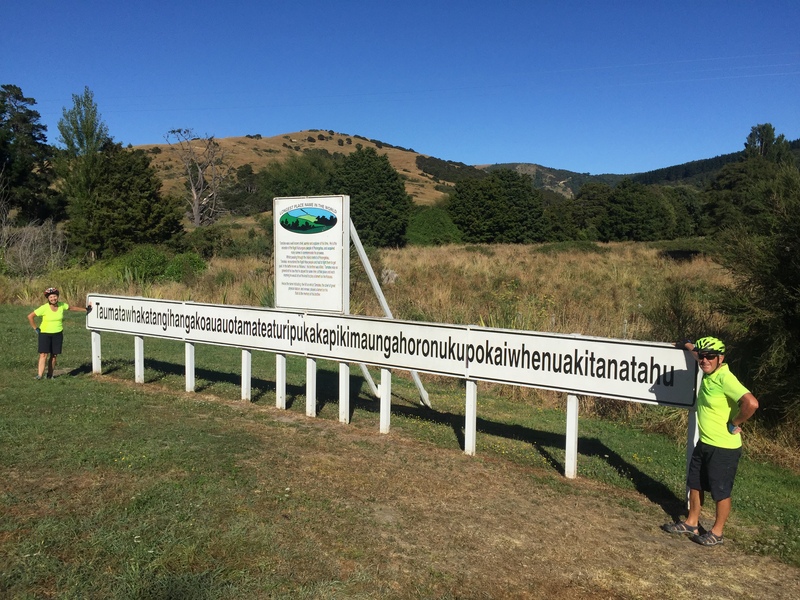 No fooling Ruth on her home turf – the sign says ‘Welcome to Taupo’ but she knows that the town is still 30km away. We have to ride past that hill in the distance. In the end it was a good ride. Not too hot, Ruth got to show me her childhood farm and schools and had a good old trip down memory lane. The two incidents of the day involved me. After a lunch break I put my gloves and sweat cap on and it was only about 2km later that I realised that I had forgotten to don my helmet. I tried to get Ruth’s attention by whistling, waving my arms, etc, but she was too far ahead of me. So I turned and biked back to retrieve the helmet and telephoned Ruth who I assumed would now be wondering what had happened to me. She said that she heard a whistling sound and thought that it sounded like a strange bird. I need to work on my whistling technique. While catching up with her a cattle truck and trailer ran me off the road. He must have been angry about having to work on a public holiday. Generally, most of the big trucks gave us wide berth and were not too concerning. But what is with all the trucks on the road on a public holiday? I know that they a diligent about lunch breaks, we never saw one truck between 12-1pm, so why not be diligent about taking public holidays? Must get a better pay rate. A very strong wind kicked in for the last 15 kilometres which did create a bit of dust nuisance. It was also a steady uphill climb but with plenty of charge on the batteries we used our pedal assist to get us home. At day’s end we agreed that day two was a good ride. After a well earned late start and giving our rather dusty clothes a wash we took a leisurely 17km ride along the Taupo lake front. Fingers crossed that the bike friendly bus arrives tomorrow and we are not left sitting at the bus stop as an unexpected double decker leaves without us. Wow, you re really two tough and skilful cookies! But while luck was sometimes leaving you for a stretch, your writing skills certainly have stayed with you. Very entertaining to read. But sobering to think that even with your super careful planning, you can have quite a lot of surprises. You can only plan for the known. Tomorrow’s bus is the next test. That stretch of the bad path looks quite a bit like the path on 4,000 Islands in Laos! What an adventure! Except that it got significantly worse, in the end the path in Laos looked like a superhighway.A A memorable moment.